Homebrewing Is Having a Moment in Philly. Here's How (and Why) to Get in on It. "Brewers are great people to know during the zombie apocalypse," Garrett Williams says with a grin. “We know how things grow. We know how things ferment. And, beer has every essential nutrient for your body.” He raises his eyebrows as if to say, case closed. 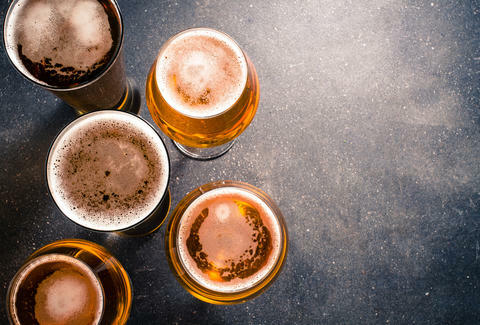 If it has to do with beer -- the intricacies of the brewing process, explaining variations in styles of beer, suggesting what food to pair it with -- Meredith Williams (a certified Cicerone) and her husband, Garrett (a certified Cicerone beer server), have got you covered. They’re the superheros of the Philly beer world. By day, Meredith is a brewer apprentice at St. Benjamin Brewing Company, and Garrett is a bar manager for Tria. And by night, they're running Home Brewed Events: beer-based education event planners teaching "Noshhh After Hours" classes throughout the city. They’ve been collaborating with a range of bars and restaurants holding demos and educating Philadelphia about the wide world of beer since 2013. They’re also throwing Philly’s first vegan beer festival this summer, but we’ll get to that in a minute. First, let’s talk about home brewing, which is clearly having a moment as competitions and clubs swell with new members. "Just the amount of breweries and brewpubs that are opening has a huge effect on homebrewers. We're going to have [a brewery] on W Passyunk, one on E Passyunk, there's going to be one in Fishtown opening up. There's more and more all the time. 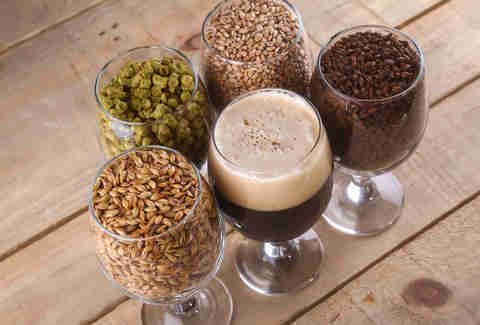 That's only going to improve the homebrewing scene in Philly," Garrett said. As more people are exposed to craft beer, the more they’ll want to understand how it’s made. If you’re interested in dipping your toes in the homebrewing world, Garrett suggests you first approach someone who already knows the homebrewing basics. Sit in a few times to give yourself a sense of what goes into the process. As for how to meet other homebrewers, Garrett jokes it’s not that hard. "It's easy to pick 'em out. They're like vegans: they'll tell you in the first five minutes." Homebrewing is a fussy process as you’re working with finicky organisms. "Walking into something like [homebrewing] blind, where there's a lot of temperature regulation and science behind it, it's pretty easy to end up with bad beer. It's also fairly simple to end up with good beer." Knowing the difference is the Garretts' bread and butter, to speak. "There's so many steps to the home brewing process and if you change one little thing, it could change the beer totally," Meredith said. "You want the beer to be as comfortable as you are. You don't want it too hot or too cold. It's like a baby. You have to take care of it. Don't forget about it when you go on vacation and turn your AC off." They stress that the easiest way to improve your beer is to regulate your fermentation temperature. Unfortunately, that's also not always an easy thing to do. "If it drops thirty degrees in the spring between daytime and nighttime, over that swing, you can really affect your beer," Garrett warned. Sanitation is also integral to the process. "You're looking to essentially create one strain of yeast involved with a specific sugar base and combining those two so it's the only thing that happens takes a lot of cleaning and a lot of sanitation," he said. Thankfully, you don’t need a lot of space to operate in when cooking up beer where you live. In fact, Meredith and Garrett started home brewing in their studio apartment. "Jim [Koch] from Sam Adams started with the same equipment we did -- a five-gallon pot on his stove," Garrett said. "And Sam [Calagione] from Dogfish Head, their original brewhouse was only a little bit bigger than ours. They'd brew 10 gallons four or five times a day just to keep up," Meredith added. As for what the couple does with their homebrewing output, well, that’s what their classes and events are for: to inspire their students by having them taste a variety of beer styles. The most common misconception about home brewing is that it’s a solitary endeavor, that it’s something lonely men do in the shadows (or in their dank basements). In fact, that couldn’t be further from the truth. "The community that's around brewing is very supportive," Meredith noted. "It is welcoming to women. Especially with the Philly Homebrew Club, there's a lot of women involved, and not just because their husbands are part of it. It’s because they want to be there and they want to learn and they brew on their own." It’s this spirit of welcoming that inspired them to launch the upcoming S.E.E.D. Festival, which stands for Sustainable Everyday Edibles and Drinkables. It’s Philly’s first-ever vegan craft food and beer festival, to be held on August 14th at SugarHouse Casino, which is good news for those who aren’t keen to drive to a drinking festival as public transportation will be readily available. Most beer events cater to meat eaters, which can be alienating to beer-swilling vegetarians and vegans. Meredith and Garrett decided to flip the script and offer an alternative, even insuring that the beer they offer at their festival will be vegan. "There's a clarifying agent made out of fish bladder [called isinglass]. Not every brewery uses it, some do," Garrett explained. By working with breweries directly, they’ll be able to confidently supply vegan beer at their festival. And with that detail, they’ve made Philadelphia beer history. Anna Goldfarb is a writer in Philadelphia and she is absolutely dying to try a beer based on the Back to the Future trilogy. Let's make an Enchantment Under the Sea beer happen, people. Follow her @AnnaGoldfarb on Twitter and Instagram.